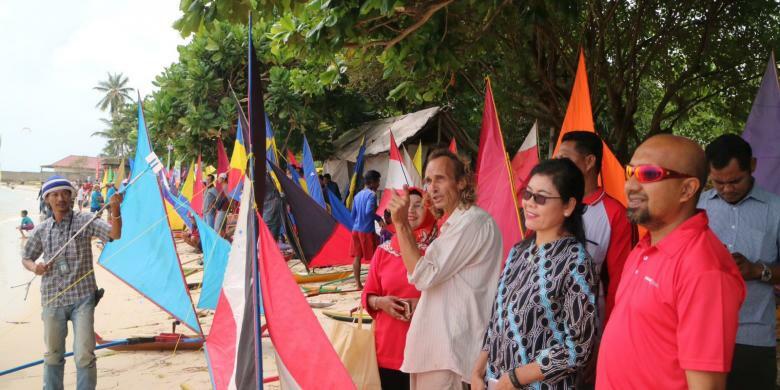 The holiday weekend is celebrated by the local Malay community in Bintan with traditional boat racing called “Utara Race Perahu Jong”. Yesterday (28/1/2017), the Trikora beach on “Kampong” Teluk Bakau, Bintan island, were filled with excitement of these traditional wind powered wooden mini boat and cheering support from competing students. Joint by more than 200 competing team, the “Utara Race” is regarded as a most awaited family events in the year of rooster. “Perahu Jong” or “Jong boat” or “Jong kong” as the local may say it, is a mini boat which can only carry small number of people used by fisherman in Riau islands of Indonesia to swiftly catches fish. The “Utara Race Perahu Jong” is a classical events which held by the local fisherman for hundreds of year. Revived by the local tourism board, the activities also becomes a bi-annual excitement which unites seafaring enthusiasts in Bintan and tourist alike. Due to wind and flow of the sea wave, “Utara Race” is usually hold in January while the “Selatan Race” commenced in August which also held alongside with Indonesian national day parade and folk games. The sailing boat event is a bi-annually held on Trikora beach of Bintan in January and August to follow the moonson season and the yearly flow of sea wave. “The competition is heavily dependent on the force of winds and sea wave,” said Zakiruddin, a participant from Sekapur Sirih School. The race begin in 10.30 AM as the contestant swim 200 meter from the beach which then release their boats away towards glory. Stretched alongside the 37 km of creamy white sandy Trikora beach, the scenery were filled by the horizon of competing sailing boats of various design and contrasting colors. For those of you that did not know, “Perahu Jong” is actually a traditional play on the regular sized wooden sailing boat used by youngster on fisherman villages back in the classical era to compete each other for speed, efficiency and for water sports. Many of the contestant built their boat by themselves by salvaging it from defunct boat and sometimes tweak them for competitiveness and pass it on for the next generation of students. We also see a group of Indonesian marines participate the events, which draws the competition becomes much interesting and picturesque as well. The events itself is free of admission for tourist. However, we did not see any international contestant either as the contest were probably intended only for the local communities to have fun, reanimating the tradition and test their seamanship. The events surely offer an inexpensive family times which brings a smile and excitement to just about anyone.